Want to look over our shoulder a bit and see what we’re doing in our own businesses? In this week’s episode we share 3 ways we’re growing our brands with Facebook Messenger! You can build subscriber lists in Facebook Messenger and send them broadcast messages and dripped message campaigns the same way you can with email. The difference with Facebook Messenger is that currently we’re seeing open rates of 85%-95%+. There are all kinds of very interactive things you can do with subscribers, and the level of engagement we get is far beyond what you can get with email. It’s like SMS marketing as far as the high open rates and the immediacy of messages being opened, but with far more interactive power than SMS! The software used to build Facebook Messenger subscriber lists and communicate with them is often called a chatbot. The chatbot we use in our business is called ManyChat (not an affiliate link). ManyChat has a free version you can get started with that is still quite powerful. Paid subscriptions start at just $10 for 500 subscribers at the time of this episode. When launching a product on Amazon (or working to boost sales), you need to send a concentrated amount of outside traffic to Amazon to purchase your product. We get people to sign up for our Facebook Messenger list by offering product giveaway drawings. We do the drawing live on Facebook, and then we offer a discount code for our product on Amazon for anyone who didn’t win. 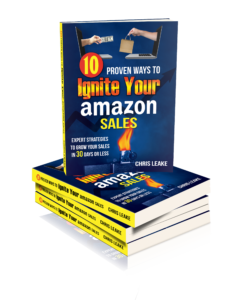 We have been able to drive a good volume of sales on Amazon in a short period of time with this strategy. The beauty of connecting with your customers through Facebook Messenger is that you already have a relationship with them before they purchase your product. This is especially helpful with those customers who purchase on Amazon. When customers have a problem, they’re far more likely to message us on Facebook first rather than just post a negative product review or leave negative seller feedback. This has allowed us to solve problems we otherwise wouldn’t have had the opportunity to solve. We’re also able to have far more success asking customers to write a review on Amazon, because they feel connected to us and want to help us. We get incredible feedback and ideas from our customers about new products or features they’d like to see us add. This has been invaluable and removes a lot of the trial and error in developing new products. Recently, we surveyed an audience we built for one of our clients and got over 400 responses. We were able to give our client a treasure trove of information about what styles, colors, and sizes of the client’s brand customers want. We also got great feedback about pricing and other product features. If you haven’t started using chatbots / Facebook Messenger lists yet, start learning! Set up a ManyChat account and begin building a powerful, engaged audience for your brand. We’re just scratching the surface of what you can do with ManyChat in what we’ve described in this podcast. The possibilities are truly remarkable! Subscribe to the eCom Leverage podcast if you haven’t already, and never miss an episode! Click here!